1. 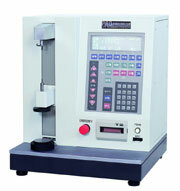 The whole series meet 05 grade (Highest Grade) requirements of JIS B 7738” Coil spring compression / tension tester’. 2. In addition to 1-step, 2-step, 3-step automatic tests, free length, initial tension load, solid length, max. load (peak hold) can also be measured. 3. Unit select able among N, gf, kgf. Lbf and inch covered by English version. 4. Measurement range can be changed through 2-step high-low range automatic switch over function, there by eliminating unnecessary step. 5. Dual unit (N and gf, kgf) printing is possible though printer setting. 50 tests condition can be stored by registering model number. 6. Test can start immediately once data are read. 7. Passing range or Good/Bad assessment is done visually by using screen display and alarm. 8. Can be connected to digital caliper, micrometer etc. and data can be printed out. 9. Ascend and descend buttons are equipped with inching function. 10.Simple movements of 1mm, 0.1mm, 0.01mm (0.001mm) are possible.